I was browsing down memory lane this morning and ran across this photo from 2002. We had made 15 life size standups of Dan Marino for a chain of stores he was involved with. 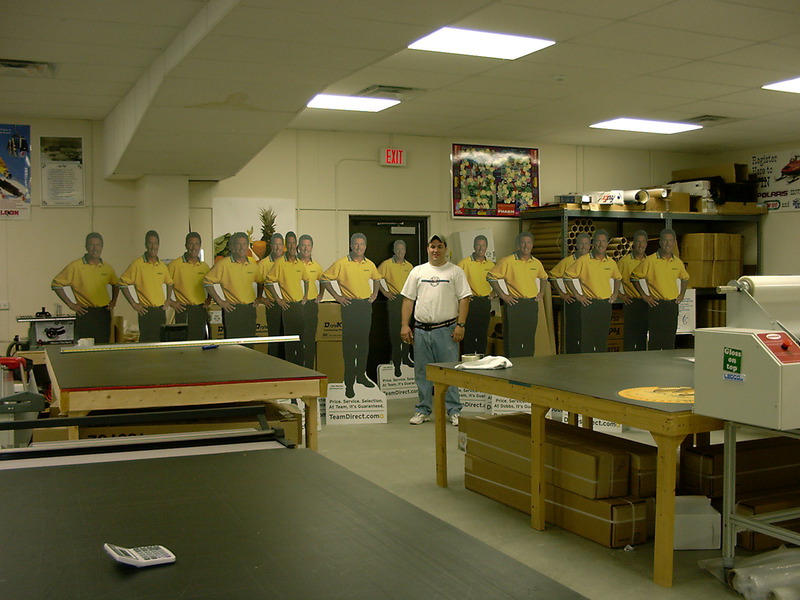 It’s a fun picture of Ken from our finishing shop (he’s still there!) and all the standups. There’s always a question about what to call these things. People often use the term “cardboard cutout” because that’s what you see of Elvis in the store at the beach. But in lower quantities, we print directly onto gatorboard with our flatbed printer, and cut them out by hand. Usually this is a less expensive way to do them for 20 or so pieces. Above that, we still print them the same way, and have them cut out with computerized routers. For more than 100 pieces, we start to think about screen printing and die cutting, which takes them out of our capability. Our system is definitely the way to go for one or a dozen pieces, and we’ve done a lot of fun work with them. We’ve done sports celebrities, political candidates, and even the characters in a Broadway show. If you want to do a life size cutout for a trade shown or an event, give us a call! This entry was posted in Flatbed printing and tagged cardboard people, full size people strandups, life size standups, people cutouts. Bookmark the permalink.